One of the things we often hear about Reiki is that it goes where it needs to. I have often said this myself, especially when I was first introduced to Reiki practice. However, over time and with personal experience in working with energy, I have come to realize that this statement may be misunderstood and oversimplified. Reiki travels to various places in the body during a Reiki session. In fact, most people who have had a Reiki session will tell you that they have had the experience of feeling energy moving throughout their body or feeling energy flow in more than one location. Many Reiki practitioners sense this, as well. Among those of us who have experienced it often, there is little doubt that energy is moving in various locations, in multiple ways. From the beginning of my experience with Reiki, I have seen that people experience shifts and healing with much more than the issue they come to treatment for. Reiki goes to the underlying issues that contribute to or create an illness, problem or pain, helping to gently open ways for the person to create a shift in their life. The shift is often so gentle and easy that they may not even be aware it’s occurring until they look back on it later. 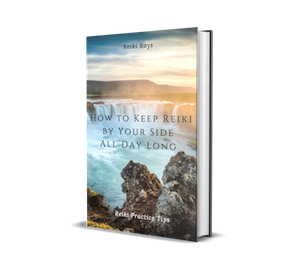 This ability of Reiki to know and bring balance to the true cause of a problem—physical, emotional or spiritual–is what I feel is truly meant by “Reiki goes where it needs to”. Neither the client nor the Reiki practitioner need to know what the underlying cause of an issue is. We don’t even need to know the issue at all in order to bring some relief and peace with a Reiki treatment. However, it would be a mistaken understanding to say that it is not beneficial to apply Reiki to the entire system. Reiki will go to the underlying issue. But the energy works by accessing the aura, chakras, and the energy pathways of the client, via the practitioner. The energy body has numerous meridians through which our energy travels. These run down the front and back of the body, from the top of our head all the way to the bottoms of our feet and everywhere in between, with important energy centers along the way. It makes a great deal of sense to apply Reiki to the entire system so that it has as many access points as possible, thus offering the best possible healing. In my practice, I am often guided or “nudged” during a Reiki session to move my hands to a different hand position, to apply Reiki in a different manner, or to stay longer than usual in a position. I feel similar things even during a distant session. I have heard many practitioners say that Reiki guides them in similar ways. If Reiki simply went wherever it needed to and we were not necessary as conduits to assist and conduct it, then we would not receive this guidance so regularly. In fact, Reiki would not need us at all! We are like the tuning forks to focus the energy where it is needed. It may get there to some degree without us, but our help brings it sharply into the areas of need. The application of Reiki directly to areas that are in pain, ill or tense simply feels good! You can certainly offer a Reiki session that only treats a small area of the body and the person will feel relaxed and will benefit. But if there is an area that is in need, there is so much good to be done by treating there, in addition to treating as much of the system as time allows. There are many times that a spot treatment is the best method, such as for an injury. We instinctively know that we should place our hands over an area that has been hurt just for this reason. I have seen people use “Reiki flows where it needs to” to minimize the role of the Reiki practitioner in the treatment. While it is a good thing to keep your ego out of the equation, you, as the Reiki channel, are important to the Reiki session! We work in cooperation with Reiki. It is similar to the manner that the cells in our bodies work with us. Our cells must work in cooperation with the overall goal of supporting the larger unit that is us. We can’t do anything very well without that cooperation, and our cells need us—they are us. Universal Life Force is the larger and more powerful energy and we are the cells that help it to function well on this level, through us. When we try to resist it or control it, things don’t go well, but when we work together, great things happen. It’s OK to acknowledge your role in as the conduit for focusing the energy and allowing it to flow. Feel free to participate fully with Reiki! Thank you madam,it’s a wonderful article and it clears so many doubts. I’m sharing this article with my local Reiki group! You can go to Meetup.com and join them for free. Then put in Reiki and see what Reiki shares are by you. Thank you, Angie! 🙂 Having studied acupressure, I agree that it is important to choose where to exactly apply Reiki and results are faster. Beautiful article as usual . But what I feel that apart from healing reiki does lot other things also . It not only flows within the body but in external environment of both the healer and the healee so as to purify the environment . Reiki does take care of any negative energy within & outer space . Thanks for the article. I have been using Reiki for a few years & use it almost every day. I have yet to experience the energy flow throughout the body as you described. However, when I’ve used it on other people I have felt the “nudge” to go in a different direction. The article puts everything nicely in perspective. This has to be the best article you have written yet! Thank you! Thank you for this excellent explanation. This also has crossed my mind. Great Article and I too believe that we are the conductors. We help aid it to bring focus to a specific area that requires more attention, which is why Reiki guides us to move our hands and keep them there longer on the body.